This husband/wife team started in 1975 when they married. Jennifer Boeke painted and Henry marketed her work at secular art shows. When they became Christians in 1983 the Boekes began their ministry, (originally named Morning Glory Art-now Jennifer Boeke Art) with the goal of creating artwork to reach out to people with visual messages of love, hope, and peace to be found in Christ. Working with many different non-profit ministries on numerous projects in a variety of venues, Jennifer Boeke’s illustrations have moved hearts to compassion and action. Glory to God, over 20 million pieces incorporating her art have been used with very fruitful results; raising awareness and funds for those organizations. Best of all babies’ lives were saved, people have been fed and sheltered, and lost souls have been impacted with love. 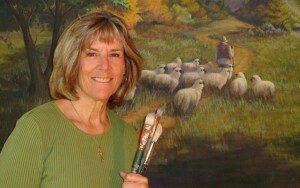 Jennifer Boeke’s years of experience as both a volunteer and pregnancy resource center director have deeply influenced and motivated her art…creating illustrations along with artist’s thoughts that encourage men and women to choose abstinence, educate them about the dangers of STDs, help women to choose life…be that parenting or making an adoption plan…and to portray the truth of and healing from abortion.